A founding member of the legendary Roar Studios of Brunswick Street, Fitzroy Melbourne, today David Larwill is recognised as a highly significant figure in Australian abstract art of the 1980s and beyond. Roar’s manifesto was “art from the heart”. The original Roar Studio was located in an old shoe factory and run as a co-op. It enabled a group of emerging artists to become established outside of the commercial gallery world of the 1980s. Roar Studio artists acknowledge early Sid Nolan works, and those of John Perceval and Danila Vassillieff, as their Figurative Expressionist influences. Roar was an artist-run gallery and it took an avant-garde approach in the tradition of the Angry Penguins literary group. "It was a reaction against the art establishment of the time and provoked a major reassessment of the Melbourne art scene," Larwill said of the philosophy behind Roar. As a co-founder of Roar Studios with Mark Schaller and Peter Ferguson in 1982, Larwill quickly attracted notice. 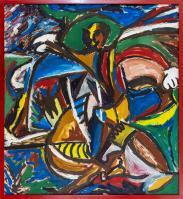 He built a reputation for his fresh, expressionist art executed with bold colour and a naïve exuberance. Larwill was also a skilled draftsman, etcher, lithographer, sculptor, and printmaker. He was educated at Mornington Secondary College on the Mornington Peninsula in Victoria graduating in 1973 then attended Frankston Technical College the following year. He studied photography, painting and sculpture, and completed a ceramics course at Prahran College of Advanced Education in Melbourne. After a period of travel in 1979, Larwill reconnected with Roar colleague Peter Ferguson and enrolled as a student at Preston Institute, where he studied under Peter Booth. Jean Dubuffet’s personal idea of “the values of savagery; I mean: instinct, passion, mood, violence, madness.”, also impacted Larwill’s approach and in a sense, he can be seen as one who almost entered the realm of “Outsider Art”. David Larwill exhibited widely throughout Australia and overseas, and his work has been translated by the internationally renowned Victorian Tapestry Workshop into several giant tapestries, the largest hanging in the Esplanade - Theatres on the bay in Singapore. As well as many private collections, he is represented in the National Gallery of Australia; Melbourne Artbank; New Parliament House Canberra; Heide Museum of Modern Art: Sir William Dobell Foundation Sydney Collection and the British Museum London as well as State and Regional Galleries including the National Gallery of Victoria; Art Gallery of NSW; Queensland Art Gallery; Geelong Regional Gallery; Ballarat Art Gallery; Toowoomba Art Gallery.